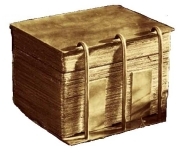 The Gold Plates or Golden Plates (also referred to derisively as the Golden Bible) are the material upon which the ancient American prophet Mormon wrote his abridgment of the record of his people. Mormon's son, Moroni buried the Gold Plates in the soil of Hill Cumorah, where they were found by Joseph Smith, who learned of their location by revelation and as instructed by the Angel Moroni. The Gold Plates were then translated by Joseph Smith from the original reformed Egyptian texts, and then published into the scriptures we have today known as the Book of Mormon. Joseph Smith said that the ancient records were engraved on plates which had the appearance of gold, each plate was six inches wide and eight inches long, and not quite so thick as common tin. They were filled with engravings, in Egyptian Characters, and bound together in a volume as the leaves of a book, with three rings running through the whole. The volume was something near six inches in thickness, a part of which was sealed. The characters on the unsealed part were small, and beautifully engraved. The whole book exhibited many marks of antiquity in its construction, and much skill in the art of engraving. The plates from which Joseph translated the Book of Mormon are called the gold plates and the golden plates interchangeably because it is unknown exactly what they were composed of. (The term Golden Bible is also used with a negative connotation.) Criticism is aimed at Joseph Smith's claims because of what appear to be historical contradictions if the plates were indeed made out of pure gold. Joseph Smith's written account mentions "gold plates," but others only said they "had the appearance of gold." There is much speculation that the Golden Plates were not comprised of "Pure" gold, rather an alloy; as pure gold likely would have been far too heavy for anyone to carry. Either way, the golden plates remain a curiosity of the Mormon religion and a symbol of the miraculous workings of the Lord. 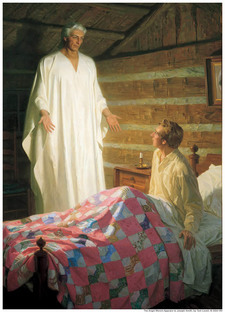 In 1820, Joseph Smith had his First Vision in which he saw God the Father and Jesus Christ. A few years later he was visited by an angel who identified himself as Moroni and told him of an ancient record. Joseph was shown the location of the gold plates in this vision. After four annual visits from the Angel Moroni, Joseph Smith was entrusted with the plates and the Urim and Thummim for the purpose of translation. The Golden Plates were received in the early morning hours of September 22, 1827 (about 8 months after his Marriage to Emma Hale on Jan. 18). Joseph borrowed a horse and wagon from a Mr. Knight. At Hill Cumorah he met Moroni who gave him final instructions and a warning, "that I should be responsible for them; that if I should let them go carelessly, or through any neglect of mine, I should be cut off; but that if I would use all my endeavors to preserve them until he, the messenger, should call for them, they should be protected." Joseph did not show the gold plates to anyone until after they had been translated, although many people, including friends and family, handled the plates through the cloth in which he kept them concealed. Soon after he got the plates, rumors of their existence spread throughout the area. Attempts were made to steal the plates but Joseph kept them well hidden. The Gold Plates were taken from Joseph Smith for a time when Martin Harris, who was working as scribe, lost the first 116 pages of the translation while keeping them at his home to show his wife. The angel Moroni took the plates and the Urim and Thummim until Joseph repented for his carelessness. When Joseph got them back Martin Harris was no longer allowed to serve as scribe. The translation was completed with Oliver Cowdery as scribe, at which time the golden plates were delivered back to the angel. Since that time many people have spoke concerning the location of the gold plates. The explanation most accepted is that they are in the possession of God. After the translation was completed, there were several witnesses appointed to testify of the truthfulness of the Book of Mormon. Three witnesses were shown the plates by the angel. Eight more witnesses were shown the plates by Joseph Smith, and allowed to touch and examine them. Each of the witnesses swore to the authenticity of the Book of Mormon and never recanted their testimony as long as they lived. Their testimony is printed in every copy of the Book of Mormon. "I lived right in the country where the plates were found from which the Book of Mormon was translated, and I know a great many things pertaining to that country. I believe I will take the liberty to tell you of another circumstance that will be as marvelous as anything can be. This is an incident in the life of Oliver Cowdery, that he did not take the liberty of telling such things in meeting as I take. "I tell these things to you, and I have a motive for doing so. I want to carry them to the ears of my brethren and sisters, and to the children also, that they may grow to an understanding of some things that seem to be entirely hidden from the human family. Oliver Cowdery went with the Prophet Joseph when he deposited these plates. Joseph did not translate all of the plates; there was a portion of them sealed, which you can learn from the Book of Doctrine and Covenants. When Joseph got the plates, the angel instructed him to carry them back to the Hill Cumorah, which he did. "Oliver says that when Joseph and Oliver went there, the hill opened, and they walked into a cave, in which there was a large and spacious room. He says he did not think, at the time, whether they had the light of the sun or artificial light, but that it was just as light as day. They laid the plates on a table; it was a large table that stood in the room. Under this table there was a pile of plates as much as two feet high, and there were altogether in this room more plates than probably many wagon loads; they were piled up in corners and along the walls. Q. Are you sure that [Joseph] had the plates at the time you were writing for him? In 1842, a visitor to Nauvoo wrote about a conversation with Joseph’s mother, Lucy Mack Smith, in which she affirmed: “I have myself seen and handled the golden plates; they are about eight inches long, and six wide; some of them are sealed together and are not to be opened and some of them are loose. They are all connected by a ring which passes through a hole at the end of each plate, and are covered with letters beautifully engraved.” However, other accounts say that Lucy saw the plates only when they were wrapped in cloth, and felt them in that condition. My grandmother in having so many extra persons to care for, besides her own large household, was often overloaded with work to such an extent that she felt it to be quite a burden. One evening, when (after having done her usual day’s work in the house) she went to the barn to milk the cows, she met a stranger [identified in another version as Moroni] carrying something on his back that looked like knapsack. At first she was a little afraid of him, but when he spoke to her in a kind, friendly tone, and began to explain to her the nature of the work which was going on in her house, she was filled with inexpressible joy and satisfaction. He then untied his knapsack and showed her a bundle of plates, which in size and appearance corresponded with the description subsequently given by the witness to the Book of Mormon. This strange person turned the leaves of the book of plates over, leaf after leaf, and also showed her the engravings upon them; after which he told her to be patient and faithful in bearing her burden a little longer, promising that if she would do so, she should be blessed; and her reward would be sure, if she proved faithful to the end. The personage then suddenly vanished with the plates, and where he went, she could not tell. From that moment my grandmother was enabled to perform her household duties with comparative ease, and she felt no more inclination to murmur because her lot was hard. Most of the accounts above can be found in John W. Welch, ed., Opening the Heavens: Accounts of Divine Manifestations, 1820-1844 (Provo: Brigham Young University Press, 2005). This page was last edited on 11 November 2011, at 00:49.